Today at 9:30 a.m. on my Grant Whisperer’s Blog Talk Radio Show, special guest Barb Larkin, CEO American Red Cross Silicon Valley Chapter, provided excellent details about the situation in Japan and also provided the valuable numbers below. Let me repeat that: If anyone you know is still waiting to hear about their loved ones in Japan, refer them to the above web site! To text a donation text REDCROSS to 90999. The donation is $10 per text and will appear on your monthly bill or will be debited from your prepaid account. The recorded episode, Special Guest – Barb Larkin, Air Date March 16, 2011, can be listened to at any time. Barb talked about the disaster in Japan, what the Red Cross is doing to support the relief efforts, disaster fundraising, and how people can help. Barb Larkin is the CEO of the American Red Cross Silicon Valley Chapter. Previously, Barb served as Director of Donor Services, Director of Development, and manager of the Silicon Valley Social Venture Fund at Community Foundation Silicon Valley. Barb has been an American Red Cross volunteer for over 16 years and is a trained Disaster Fundraising Officer. She is a member of American Red Cross Disaster Services Human Resources system having worked on several disasters including Hurricane Katrina, the San Bernardino wildfires, and Hurricane George. Tune in to the Blog Talk Radio episode to hear about the relief efforts. 10,000 people are now feared dead. As the heartbreaking news of the enormous loss of life unfolds, strong aftershocks (6.2 magnitude) continue to strike and the nuclear power plant meltdown threats increase (though officials insist the reactors remain intact). To add further to the images of desolation, Japan now has hundreds of thousands of survivors without food, water and electricity. As if all this wasn’t enough to break the spirit, tsunami warnings broke out again in the Fukishima area. Reports have come out that the village hardest hit, Minamisanriku, had residents who received a 30-minute warning between the 8.9 earthquake and the tsunami. Thirty minutes to recover from a violent shaking of the earth, gather loved ones, and escape. Those residents then tried to flee the village all at the same time, blocking roadways and becoming trapped. As families still wait to hear from loved ones, they can only hope and pray. The situation keeps worsening in Japan. Not only did Friday’s quake and resulting tsunami ravage Japan’s eastern coast, but now 686 are confirmed dead and 9,500 people are missing from the coastal village of Minamisanriku. Authorities confirmed that only about 7,500 residents were evacuated from the village of 17,000 residents. Aided by emergency responders from dozens of countries, 50,000 Japanese troops have joined the rescue and recovery efforts. More than 215,000 people are living in temporary shelters in five prefectures (states). And more than 170,000 were evacuated from their homes due to the threat of radiation from a nuclear power plant malfunction. Earthquake, tsunamis, fires, aftershocks, and now a looming nuclear power plant disaster. Japan has been hammered in the last 24 hours. As the death toll rises and reports of over 700 hundred missing and thousands injured continues, we can only imagine what the survivors are experiencing. National Oceanic & Atmospheric Administration (NOAA) map on 11 March 2011 shows the predicted travel times of the tsunami. However, the quake has forced the closure of five nuclear power plants in Japan. Kyodo News reported at 2:00pm that radiation 1,000 times higher than normal is being detected at the Fukushima nuclear plant. MSNBC.com interviewed, Edwin Lyman, a senior scientist with the Union of Concerned Scientists. “It’s just as bad as it sounds,” he said. But Steve Kerekes, spokesman for the U.S.-based Nuclear Energy Institute, said that while the situation was serious, a meltdown remains unlikely. At 2:46 pm a magnitude 8.9 earthquake rocked Japan. This is Japan’s largest quake on record, and one of the largest ever recorded in the world. The epicenter was 231 miles northeast of Tokyo. The quake triggered a 32-foot tsunami that pummeled Japan’s eastern coast, killing hundreds of people as it swept away everything in its path. In the cities closest to the epicenter, Sendai and Honshu, hundreds of bodies were found with over 500 people reported missing and 627 people injured. More than 50 aftershocks have been recorded, with tremors reaching as far as Tokyo. The photos of the region show catastrophic devastation. 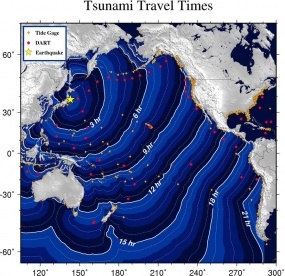 According to the U.S. Geological Survey, a tsunami warning has been issued for parts of the U.S. West Coast in addition to the earlier warning for Hawaii and the western Pacific islands. A 7-foot tsunami reached Hawaii at 9:00 am but did not cause major damage. Officials warned that the waves could get larger. A magnitude 7.3 struck this area of Japan two days ago, causing no damage.